Today T-Mobile has announced Un-carrier Amped, which is basically this: you take an existing Un-carrier announcement, and you amp it up. Simple. Un-carrier 2.0 will be the first to receive such amptituding. For those that don't remember, T-Mobile's second carrier-busting announcement introduced its JUMP! plan, which let you upgrade your phone every six months for a $10 monthly fee. Now T-Mobile is upping that payment to $15 or so a month as part of JUMP! On Demand. In exchange, you no longer have to pay for your device separately. Edit: Now T-Mobile is getting rid of the separate fee with JUMP! On Demand. With the new plan, you get to choose a phone to borrow for 18 months and swap it out up to three times a year, whenever you want. You don't need to make an upfront payment to walk out of the carrier store with a new handset. You just have to pay the monthly device fee that varies depending on what you get. T-Mobile has provided full details in a JUMP! On Demand fact sheet. In addition to the information covered here, it includes a few prices, such as $24.99 for the LG G4 and $28.33 for the Galaxy S6. Of course, there's a trade off. At no point do you actually own any of the phones that you get as part of JUMP! On Demand. This is a leasing plan. When you cancel, remaining payments are due, and you must return the device. If you like having the latest and greatest without having to wait or spend much money, this might do the trick. But if you like actually having the latest and greatest, leasing isn't the way to go. On the fence? Here, let John Legere break it down for you. Things sound so much more compelling coming from him. The plan will become available June 28th. Bellevue, Washington — June 25, 2015 —Two years ago, T-Mobile [NYSE: TMUS] promised to take on a wireless industry that’d grown too fat to give a damn about its customers. Since then, the Un-carrier™ has eliminated the worst of the carrier abuses with an aggressive drumbeat of industry-rocking moves—and Americans have responded by making T-Mobile America’s fastest growing wireless company. But the company isn’t stopping there. T-Mobile is rolling out a series of epic updates to some of its wildly popular Un-carrier moves this summer and calling it ‘Un-carrier Amped!’ So today, the company kicked things off in a big way by amping up Un-carrier 2.0, its groundbreaking JUMP!® program, and introducing the industry’s lowest monthly cost to get an iPhone 6 when you trade-in your smartphone. With T-Mobile’s new JUMP! On Demand™, one low monthly phone payment covers the cost of a new smartphone and gives you the freedom to swap it for a new one absolutely anytime you like … at no extra cost. Which means you don’t pay a penny to walk out the door with your new smartphone today–not even sales tax, with qualifying credit. No fees to upgrade whenever you want, no waiting and no worries about paying off your old phone when you upgrade. Hear more about JUMP! On Demand from Legere in his latest video blog. Nearly half of Americans say they wish their carrier would let them upgrade their smartphone more often. So they’re counting the days until they can get that next new smartphone. With Jump! On Demand, you can get a new smartphone whenever you want at no extra cost. Here’s how JUMP! On Demand works: Get a new smartphone for zero out of pocket with qualifying credit, and zero sales tax due today, followed by one low monthly payment that includes the cost of that new smartphone and, for free, the ultimate freedom to upgrade whenever you want. When you want a new smartphone, just swap your old phone for a new one. That’s it. Customers with JUMP! On Demand can upgrade anytime − tomorrow, next week or next month − up to three times a year. Simply bring in the last phone you got with JUMP! On Demand for a quick three-point check-up to ensure it’s in good working order and swap it out for a new smartphone. Which means you could get six brand new phones during the time it’d take to get one upgrade at Verizon. When you get a smartphone with JUMP! On Demand, your monthly payment is about the same as it would be with regular financing, and there’s no extra $10 monthly program fee. T-Mobile’s most popular smartphones are available with JUMP! On Demand. See the full list of available smartphones at www.t-mobile.com/jumpondemand in the FAQs. Existing JUMP! 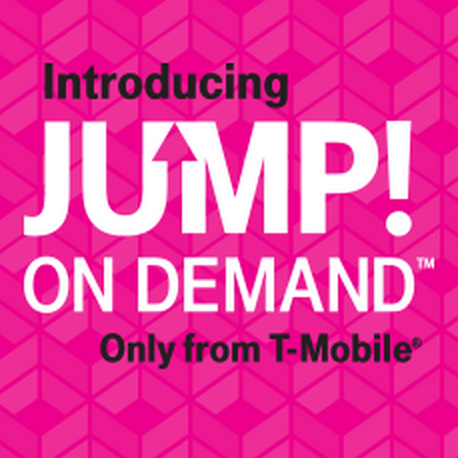 customers can get a new smartphone with JUMP! On Demand the next time they upgrade, and won’t have to pay that extra $10 per month because the ability to upgrade whenever you want is now included in your monthly phone payment. And, if you still want device insurance (Premium Handset Protection), it only costs $8 per month. 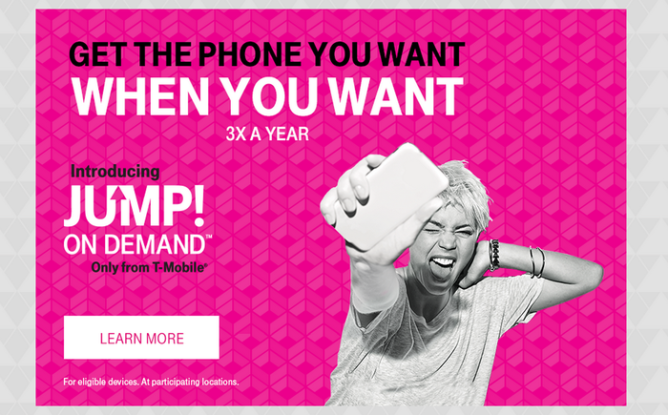 Nearly two years ago, T-Mobile rocked the wireless industry with JUMP! so Americans could upgrade when they want, not when they’re told. JUMP! busted down the barriers to upgrading, and it was a huge hit. Over 10 million people signed on and made the most of JUMP!, upgrading their phones 30% faster than everyone else—every 14 months compared to the industry-average of nearly 20 months. JUMP! was so disruptive, the carriers were forced to roll out their own knock-off “early upgrade” programs. But they’ve been changing their fine print ever since. Today, carrier customers are forced to wait even longer and pay more to get the phone they want. Verizon Edge customers originally had to pay off 50% of their phone before they could upgrade. Then Verizon upped the payout to 75%. Now, they make you pay off 100% of your phone before you can upgrade—which can take 24 months. Now, for a limited time, you can get iPhone 6 with 16GB at the industry’s lowest monthly cost of $15 a month with JUMP! On Demand when you trade-in your current smartphone. That’s an unbeatable price the competition just can’t touch. And with JUMP! On Demand, you can easily upgrade to the latest iPhone at any time. With Jump! On Demand, you make payments on your phone for 18 months. After 18 months, you can simply turn in your phone with nothing more to pay, or upgrade to your next new phone and start a new plan, or make a final payment and keep your phone. If you keep your phone and make the final payment, the total of your payments will equal the retail price of the phone. In addition, customers can pay off their JUMP! On Demand plan at any time by paying the remaining payments in advance, and keep their phone without penalty. JUMP! On Demand is available in participating T-Mobile stores nationwide starting June 28th. For more information, visit www.t-mobile.com/jumpondemand. And follow T-Mobile CEO John Legere on Twitter (www.twitter.com/JohnLegere) to see how he’s planning to surprise his followers and celebrate the launch of JUMP! On Demand with them. $0 down at signing + $15/mo for 18 mo. lease O.A.C. If you cancel wireless service, remaining lease payments become due. Device must be returned in good condition or purchase option exercised ($164 for iPhone 6 offer) at cancellation or after 18 mos. Qual’g service, eligible device trade-in & upgrade req’d. No device security deposit. Monthly taxes additional.